The questions have been paraphrased and the identities of those posing the questions are not revealed to protect their privacy. 1. Where is Vodou practiced and how did it get to Haiti? Vodou is practiced wherever there is a population of people of West African descent. Vodou is the Ewe-Dahomean (now Benin) word for that which is far and apart from us. It also means spirit. In Haiti, Vodou refers to the Traditional Religions of the West Coast of Africa. Since Africans were taken all over the Americas, Vodou is practiced throughout the Americas. It is called Santeria and Lukumi in Cuba, Shango Baptist in Trinidad, Obeah in Jamaica, Candomble and Paolo Mayombe in Brazil. As much of the US population is of African descent, Vodou philosophy is ubiquitous in American culture. In short, Vodou came to the Americas on the same ships that brought the Christian Churches to the Americas. It is in an unwilling partnership that the Native population, Europeans, and Africans built the Americas. 2. What is Vodou? Is it good or bad? How did Vodou and Makanda help in the Haitian Revolution? 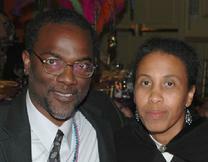 Vodou is the relationship that a person has with God and with his Ancestors, called Lwa in Haiti. It is best defined as the bond between the visible and the invisible (Vizib ak Envizib). That bond is the etymology of the word religion. The single most important principle in Vodou is remembrance. This is why we pour libation to the Ancestors. It is to remember them. Vodou is no better and no worse than any other religion. On a global scale, one can favorably compare the destructive activities of Sèvitès against those of followers of any other faiths. During the 17th century Makanda was one name for Vodou in Haiti. The term is a Kongo word meaning our family. Interestingly, during the 17th century, the Catholic Church in the Kongo used to call the Bible, Kanda. Vodou / Makanda was vilified by those who sought to isolate the Haitian Revolution. The success of the Revolution was widely attributed to Vodou. In reality, the Revolution was successful because of the ingenuity and perseverance of our fore-parents. Rather than admit to that, the countries involved in the commerce of people as slaves preferred to say that they lost in Haiti because the Haitian people were aided by mysterious forces. This was just a covert way of saying that one on one, men to men, women to women, we could not match them. The Revolution was not a battle between Christians and Sèvitè but one between people. Religions did not fight. People fought. 3. Can a person use Vodou to harm another? It should be clear to everyone that premature death in Haiti is an outcome of Haiti's poverty and not of its religion. The poverty of Honduras for example is an outcome of its history and not of its Christianity. Certainly, people in Haiti who want to control the gullible can claim to have superhuman powers. In reality, the gullible are victims of their own stupidity and not of anyone's superhuman ability. The Haitian people commonly lay this bare and say: Konplo fò pase wanga. 4. The US State Department wrote this about Creole and Vodou: “French is one of two official languages, but it is spoken fluently by only about 10% of the people. All Haitians speak Creole, the country's other official language. English and Spanish are increasingly used as second languages among the young and in the business sector. The dominant religion is Roman Catholicism. Increasing numbers of Haitians have converted to Protestantism through the work of missionaries active throughout the country. Much of the population also practices voudou (voodoo), recognized by the government as a religion in April 2003. Haitians tend to see no conflict in these African-rooted beliefs coexisting with Christian faith.” Source: http://www.state.gov/r/pa/ei/bgn/1982.htm What do you at Bookmanlit think of this State Department information? First, the correct spelling is Vodou. This spelling obeys Creole rules for spelling while distinguishing the religion from its caricature in Hollywood films. We think the statement from the US state office lacks precision. For example, Spanish has always been spoken by a large segment of the population, particularly by those living on the Dominican border. English has become popular because nearly all of Haiti's business is with the US where its diaspora lives. Interestingly, Haiti's French influence is not from French occupation, but rather from an arbitrary decision taken by people who were educated in France to teach French in Haitian schools. This is the reason why French is predominantly learned in schools. 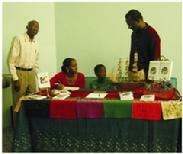 Creole is learned everywhere and is independent of government subsidies. Note, unlike French, Spanish is learned mostly outside of schools in interaction with Spanish speaking Dominicans. Polls on religious membership in Haiti are of dubious value because of prestige associated with certain religions. What we can say is that the Catholic Church having been the official religion of France and of the Kongo has enjoyed wide popularity in Haiti, and like the French language, it too is subsidized by the government. It is the religion of the power-holders. The American Protestant churches gained momentum in Haiti during the US occupation in 1915 and continue to gain converts largely because of their links to the US economy. Note the Protestant churches popular in Haiti are the Presbytarian church, Baptist church, Seven day Adventist, Jehovah Witness and other American churches. Native Protestant churches from Latin America and from Eastern Europe are squeezed out of Haiti because they are comparatively poor and can't compete. In the text written by the US Embassy, Vodou is not capitalized. This is disrespectful when other faiths are capitalized. When writing about religions we should capitalize all of them or none of them. Questions on the frequency of Vodou practice in Haiti are hard to determine because they depend on how Vodou is defined. In addition, unlike the other Middle Eastern and recent European derived religions, Vodou is not organized like a club where one is a member who adheres to principles laid out by the club leaders. Rather, Vodou is a personal religion, derived from one's own heritage. Since over 90% of the Haitian population is of West African Ancestry, Vodou philosophy is ubiquitous in Haitian society. If however, one defines Vodou's popularity by the number of people who attend services in Honfos, then the number of followers becomes much smaller. Haitians see no conflict between African based worship and recent European based style of worship because indeed there is no substantial difference between them. They are both based on the belief that spirits can act in the world of the living. Most often these spirits are people who have died. To put it bluntly, the two religions differ only by whose dead is praised. In this respect, there is no substantial difference between Vodou and Christianity. Christianity is a recent religion that sprang out of the many Vodou-like religions of the Middle East and of Europe. The Haitian perspective on this is right. In general the Lwas are spirits of departed Ancestors. A few are spirits that God created at the time of creation. As ancestors the Lwas are often called by the ancestral homeland, Ginen. To emphasize their blood relationship to us, we commonly call them Grann, as in Grann Aloumandya, Grann Zinga, Grann Hessou, Grann Ezili and so forth. The Lwas were created by God to assist people in their daily life. This gives rise to the expression: se Bondye ki ba mwen Lwa a kenbe- it is God who has given me the Lwas. God created the Lwas and reigns above them. This is expressed commonly as apre Dye, Ginen yo. Having created the Lwas, God is not jealous of service to them. Besides, jealousy is a vice and as such is not characteristic of God. As ancestors to us, the Lwas are generally classified as Rada or Petwo. This classification has largely replaced the Hot and Cool classification used in Dahomey (Benin). It also replaced Water and Forest classification used in the Kongo. The latter classification is sometimes referred to as Zanj Lan Dlo and Zanj Lan Bwa. The Rada and Petwo classification is the most widely used classification in Haiti and it reflects the temperament of the Lwas as well as geographical origins of the Lwas. They are either from the West Coast of Ginen and are called Rada in honor of the capital city of Dahomey or they are from the Kongo area and are called Petwo in honor of Don Petwo, the king that virtually re-unified the great Kongo Empire in 1709. 6. Regarding Bicentennial: Haiti’s Gift to the World: I read your book “Bicentennial” and to tell you the truth, I have never read Haitian History this way before. What really motivated you to make a presentation in that fashion? For a long time historians treated history as though it were the chronicle of the lives of the rich, famous, and powerful. History books were used as just another way to immortalize such people. Many books on Haitian history have also fallen into this trap. We wanted to write a book that we could pass on to our children to help them understand the Haitian family journey from various places in the world to Haiti and to the diaspora. From this perspective, what becomes important is how we have come to be Haitians. Our history is to explain who we are, why we worship, speak, eat, play, dress, and work in distinctive ways. We also recognize that we are important determinants of the course of our lives. As the main cast in our history, the Haitian people deserve to be treated respectfully. Too often writers write about history as though it were a treatise on the defense of their social class and buddies. Modern historians have now recognized this problem and use archeological records, even where written works exist, to correct distortions in how the story has been told. For example, the recovery of the pirate ship Whydah (Wida) revealed that many of the pirates on board were of African descent. This has allowed us to recognize that a life at sea was another way of escaping the barbarism of the Code Noir. The use of vocabulary inherited from racist literature caused many Haitian writers to use inappropriate terms in describing our people even when culturally appropriate ones abound. The Haitian people call their ancestral land Ginen and so this is what we call it in the book as well. They call their former states nanchon. It is their forebears who came from there. We think they know best how to describe it. For this reason, we do not use the derogatory term tribe. We use what we call it, Nanchon. A good translation of nanchon is country or ethnic group. In other words, se nou ki soti la, se nou ki konn jan l rele. Finally, we do not use the term slaves to describe the people of Ginen. They were first and foremost human, and the term slave does not capture their humanity well and encourages negative stereotypes about their worth and intellect. We use the term enslaved people so that the reader is constantly reminded that it is people's lives that we are talking about. For this same reason, the term slave trade is not used but rather the Trans-Atlantic Trade in People. As important as Wall Street, Mache Kwabosal was one of the leading markets in the world selling people. In short, in writing Bicentennial: Haiti's Gift to the World, we had to re-examine Haitian history to correct for the devaluing of people of Ginen ancestry. We also had to use currently available scientific approaches, archeologic findings, and oral traditions to correct for previous errors in reporting our history. 7. Is a restavèk a slave? The restavèk situation in Haiti is so deplorable that we have since our last visit to Haiti promised to raise this issue at every opportunity. In general, holding a child as a restavèk is a monstrous crime. However, it is not slavery like the one that the French enforced in Haiti in the 17th and 18th century. That French government slavery was enforced by law. In Haiti, people (especially children) are abused because the government fails to enforce the law. In general, people should work for pay. Only adults should be employed because they have the power to defend their self interest. They can walk away from the job. Children are not suitable employees. They are a vulnerable population that cannot say no. If the economic situation of Haiti is so dire that it requires children to seek shelter in homes outside that of their parents, then such children should be registered with the government. In this way, the government can check periodically that they are being treated in a humane way. Should the government fail at this, then these children can sue the government when they become adults. It is only by holding “foster parents” and the government accountable, that numerous children will have the right to a childhood. There are many good and bad books on the subject of restavèks. So choose carefully. Some authors writing on the topic are plainly ill informed. Their books are filled with stereotypes about Haiti disguised as knowledge. Often, the restavèk issue is treated to stain the image of Haiti rather than to discuss it in an informed manner. 8. How many different type of drums are used in Haiti? There are several kinds of Haitian drums. There are Rada and Petwo drums. Rada refers to Dahomean type drums and the Petwo drums are the Kongo drums. The largest drum in the western Hemisphere is the Haitan Asòtò drum which can be 7 feet tall or more. That drum is also a Dahomean type drum. The Rada drums have pegs holding the skin and is made with leather from cow skin. The Petwo drum is made with leather from goat skin and the skin is tied to the base of the drum using ropes. The Kongo drum was adapted by modern musical assemblies as the congas. This drum type is popular wherever there were large numbers of Kongo people like in Haiti, Cuba and the US. The Rada drums are usually played in sets of 3 drums called the Manman, Segon and Boula. This assembly of 3 drums likely reflects the importance of marasa 3 in the Rada region of Africa. Similarly the Petwo drum in played in sets of two drums: the gwo baka and ti baka. Baka or Mbaka is also the name of an ethnic group residing in the Kongo. Over the years, other Haitan drums have become less popular. The Lowango drum from the Loango people of Ginen is now not as common. It resembles the Kongo/Petwo drum but is more slender. There is another flat Haitian drum called bas which is used to generate low frequency sounds. The fundamental technique used for playing a drum assembly has become the basis for all popular form of music from the Americas. The assembly plays in a multi-rhythmic manner, each drum accompanies each other using a a complimentary but different beat. The smallest drum is used for time keeping and the rhythm played on it is called Kata. The layering of different rhythms over that of a central beat is how musicians keep time when playing Konpa, Salsa, Jazz, and Rythm and Blues, to name but a few modern Afrocentric musical genre. It appears that as a result of the Rejèt movement, some of the elaborate carvings that used to be done on Haitian drums have been simplified and replaced with painting the drums instead. Commonly the drums are painted in a dotted manner to reflect the power associated with them. The dotted pattern is borrowed from the skin of the great felines of Africa, hence a metaphor for power. One name for drum by the Adja people of Dahomen (Benin) is hontò. This is why we commonly say let the drum play, let it play as: Hontò rele hontò lele o.